The effects of World War II on the coconut definitive were felt before the war came to Malaya's shores. After Italy entered the war in 1940 interrupting communications via the Mediterranean, supplies of the $5 ran low as people opted to send air mail to Britain via the faster but more expensive Pacific route (Proud 2000). 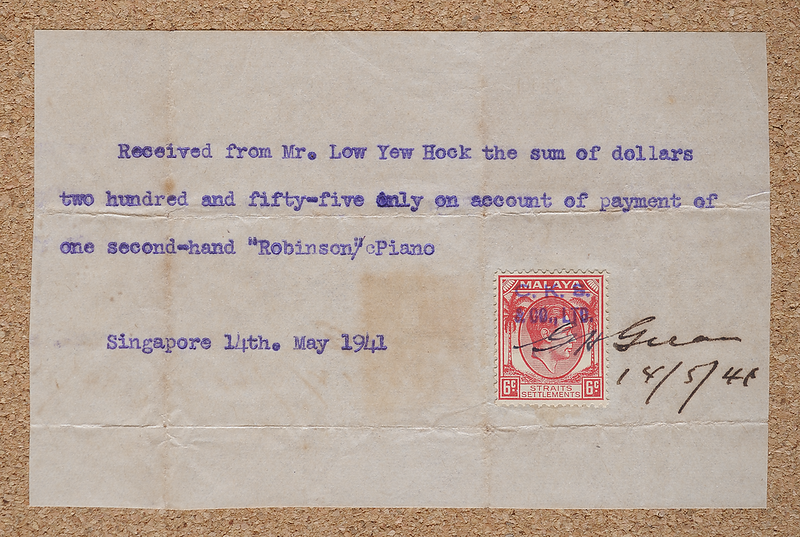 See Lee (2018b) and Waugh (2018) for coconut definitives used on the last air mails that got out before the fall of Singapore. Some coconut denominations were distributed in the Federated Malay States in 1941 (Proud 2000 pp. 80–83) to compensate for shortfalls resulting from the bombing of De La Rue's various facilities in London in September, November and December 1940 (Vousden 1996a). 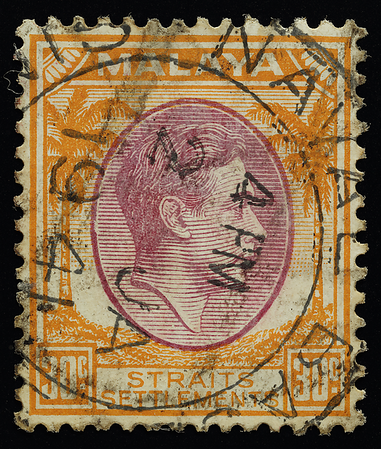 None of the Straits Settlements plates, however, was believed to have been damaged during the blitz (see Vousden 1996a). Subsequently, other printers—Waterlow, Bradbury Wilkinson and Harrison—helped with printing (Holley 1994). Field post offices were temporary facilities set up in wartime for use by military forces. 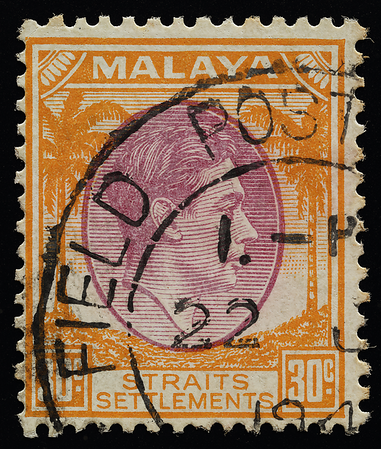 See Golden (1962) and Fryer (1963) for surveys of locations and dates of field post offices in Malaya. Also see Stanway & Peters (1990) and Lee (2018a) for military mail bearing coconut definitives. The art of positioning a circular date stamp is no more gloriously expounded than when all essential information is encompassed under the quadrilateral authority of the duty plate. The Singapore Naval base was a massive installation completed in 1939 to counter Japanese military expansion in the Far East, but did not have enough ships to fulfil its mission. Today it has been reborn as Sembawang Shipyard, home of Singapore's Naval Diving Unit as well as an outpost for foreign armed forces like the Royal Navy, US Navy and US Air Force. Ships were essential for transporting supplies and troops, but were vulnerable to attack. From a letter postmarked May 1941. A red coconut definitive reminiscent of an oriental seal on a scissor-cut, hand-typed receipt unlike the usual chits with details written in on pre-printed templates. Hopefully the old piano helped tide its new owner through the war years with the sonatas of Beethoven and the études of Rachmaninoff. 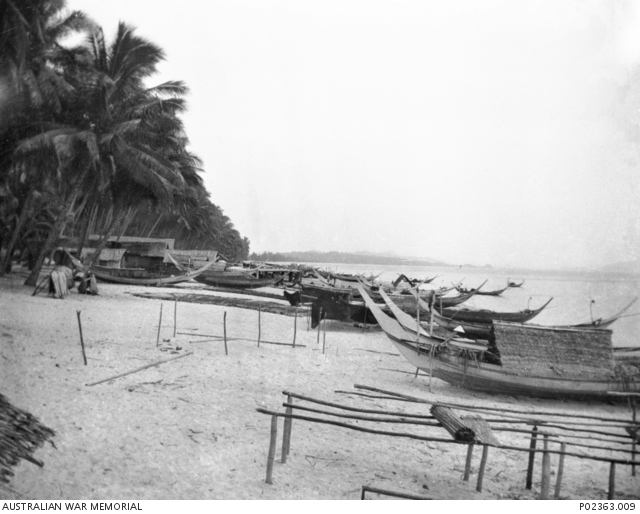 Bachok beach in Kota Bahru (July 1941), one of the possible Japanese landing sites that saw the start of the first major offensive of the Pacific war. Growing in abundance are the blissful coconut palms immortalized in the coconut definitive. 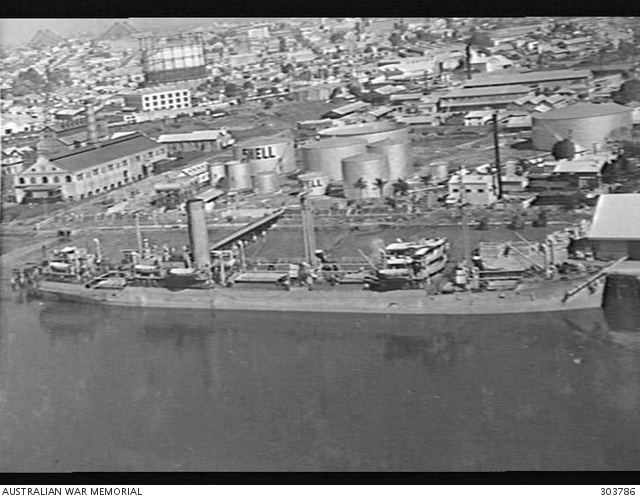 The MV Phrontis (built 1926, displacement 6635 tons), seen here in Brisbane, was one of the ships that had evacuated coconut definitives to Melbourne at the outbreak of war in 1941/1942 (Peter Cockburn comm. 2017). The ship was sold to Saudi Arabia in 1958 and renamed the Ryad. 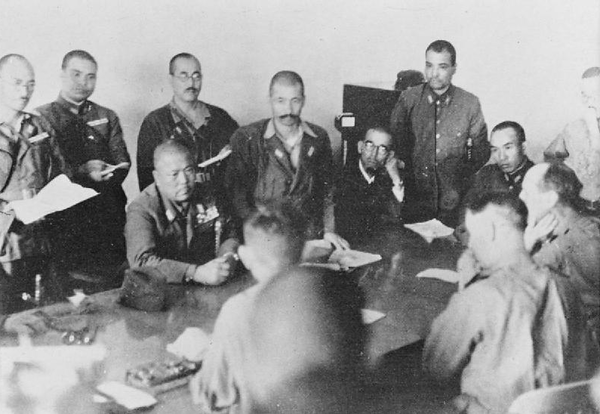 The surrender of British forces to Lieutenant-General Tomoyuki Yamashita at the Ford Factory in Bukit Timah, Singapore, on 15 February 1942. Source: Imperial War Museum. 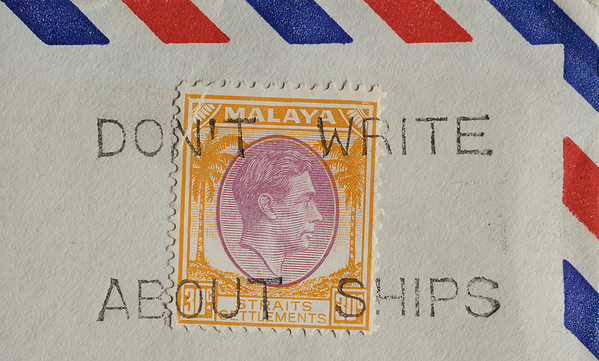 When the 25th Army under the command of General Yamashita blitzed down the Malay peninsula like a tsunami in December 1941 and British forces beat a hasty retreat, postage stamps were probably the last thing on their minds. 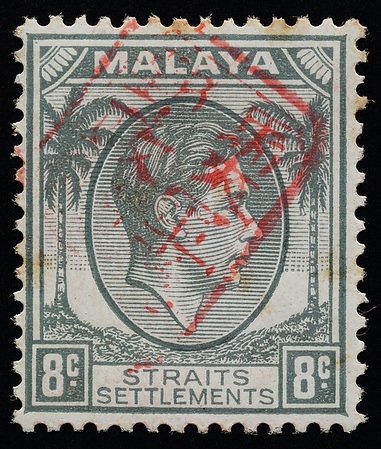 Stamps were abandoned en masse by the vanquished and inherited by the conquerors who now faced a problem: they could not let those stamps be used without some marking proclaiming that Malaya now belonged to the Japanese Empire. The large stock of stamps would breed a profusion of overprints made with wood, bamboo, ivory, rubber and steel chops and constituting a typographical treasure trove. The stamps thus became a virulent carrier of propaganda, spreading quickly and over great distances through the postal network. Singer (1997) has a detailed listing of varieties. The 25 cents is thought to have escaped the occupation altogether, as it had apparently run out before the arrival of the Japanese due to heavy usage in British military airmail (Carpenter 1990). Yet there have been reports of it being overprinted and even issued (e.g. Tan 1999, Khoo 1966). The earliest overprint, dating from the resumption of postal services in Singapore on 16 March 1942, was known as the Gunsei-bu double-frame overprint, containing the expression 'Malaya Military Government Division Postal Services Bureau Seal' in Kanji characters (read from top to bottom, right to left) enclosed within a double rectangular frame. It was applied by hand using three hand-carved chops probably made of bamboo (Dewey 1959a, Coulter 1965). The broken and relatively unrefined frame and characters seem to reveal the haste in which the seals were made and the difficulty of working with the recalcitrant grain of bamboo. Nevertheless, the engravers "mounted" it nicely by making the outer frame thicker than the inner. During the Ming Dynasty in China, bamboo was valued over expensive items like ivory or gold by scholars who embraced culture and eschewed materialism. Nowadays, bamboo can even be laser-engraved. 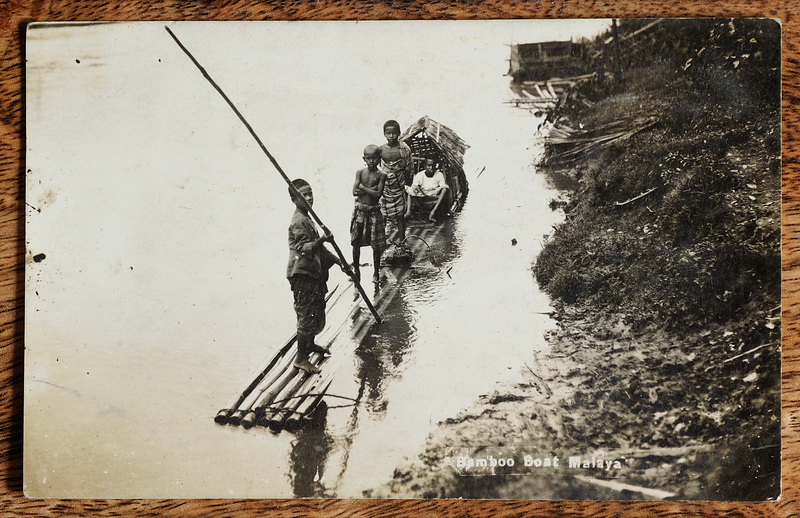 Another use of bamboo, in one of the simplest forms of transport on shallow and slow-flowing watercourses in Malaya. The author once rode it on the Sungai Tembeling in Pahang. This one has a roofed structure, highly unusual for such ephemeral vehicles. Confusion reigns over the authenticity of double-frame overprints, because early catalogues disagreed on their sizes and used forgeries to illustrate them (Gallatly 1962a). A forgery of the double-frame overprint has even appeared on a cover used during the occupation itself (Tsuchiya 1999). In ancient times, red ink was exclusive to the samurai. The ink used here was either a mixture of ground red lead (Pb3O4) and wood oil, or foreign inking pads which were much more common (Adgey-Edgar 1946). Red lead has been used since Roman times and is found in some outdoor paints and lead-acid batteries. 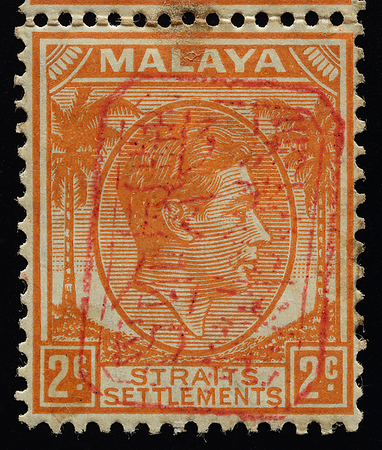 The double-frame overprint was later replaced by the very similar but even more cult-status single-frame overprint. See Gallatly (1962a), Coulter (1965) and Cheah (2007b) for chop identification keys and forgeries relating to the Japanese occupation at large, and Dewey (1959b, 1961) for overprinting errors accidental and deliberate.